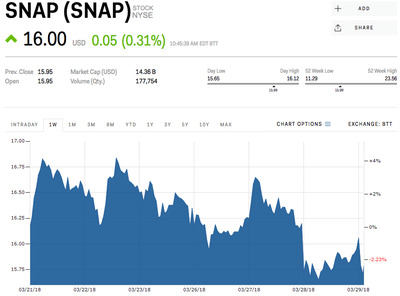 Snap is teetering around $US15 a share Thursday after announcing layoffs. The company announced it was eliminating 100 jobs in advertising and sales. See Snap trade in real time here. Shares of Snap are seesawing Thursday, currently up 0.31%, after Imran Khan, the company’s chief strategy officer, said the company intends to cut 100 jobs in advertising and sales, according to a Bloomberg report. Snap has fallen just 2.5% since March 19th, the day the broader tech sell-off began on news of Facebook’s massive data breach. The broader Nasdaq 100 has slumped 6.6% over that time. “These changes reflect our view that tighter integration and closer collaboration between our teams is a critical component of sustainably growing our business,” Khan said in a statement. “While this process has required us to make some really tough decisions, we believe that rigorously ensuring our team structure always aligns with our goals will make us stronger,” he added. Thursday’s announcement was the latest in a string of job cuts in recent months. In March, Snap eliminated 120 positions in its engineering department. Those cuts followed about two dozen layoffs in its content team in January. Snap shares are up 6% year-to-date.